I’m often asked which attractions at Disney World should have Fastpass+ booked in advance. Onsite guests can reserve FP 60 days in advance at 7am and Offsite guests can reserve them 30 days in advance at 7am. If you are unsure when you can book them, check out my Disney World Crowd Calendars for your exact dates. If you are unsure where the attractions are located, check out my special Disney World Maps that also include character meet and greet locations. Kali River Rapids – warm weather months! Previous PostWalt Disney World Fastpass+ Kiosk Locations and MyMagic+ Service CentersNext PostWhere can I purchase a MagicBand at Walt Disney World? So, I’m guessing that if I use a fast pass for Rivers of light or another end-of-day show, that would prevent me from booking a fourth or more fastpass, as I will not have used all three already? Do you pick fast passes at midnight or 7 am? I have read two different times. I know the FP+ are tiered. Quick question. If we don’t want to do a tier 1, can we pick 3 from tier 2? For example (dare I say it), my family and I are not into Pandora, so we were hoping to skip those rides and just accomplish 3 of the others. Thanks! I was thinking of trying to push out my fantasyland fps that day for belle and mine ride and rope drop tomorrowland like you recommended. Thanks again!! Hi! I’m heading to Disney in August. I have two days at MK. I already selected my fast passes. I have the mine ride both days because of the wait times. However I’ve noticed that space mountain seems to have the longest wait times right now. Anyone recommend to scrap the mine ride fp on day 2 and grab a space mountain one? Thanks! Can you use the 3 fast passes over different resorts (for example, spend the morning with 2 fast passes at the magic kingdom and then have a fast pass booked for hollywood studios in the evening)? Also, at the 60 day window of your first day, can you book all your fast passes for the whole time your there even if it would be more than 60 days. Or do you do every days fast passes one day at a time? (for example, if you were at Disney world from the 1st – 8th of November and 60 days ahead was 2nd of September, could you book all your fast passes on that day, or only the 1st and then the next day you could do the 2nd. Is that the same for dinning reservations? No. You can only book at one park. You can however book one FP at MK, then book the 2nd at Ep, AK or DHS in the park, if you wish, but it limits what is available. can you book a fast pass before you have your park tickets linked to your My Disney Experience account if you have on site hotel? We are going 03/17 and have our hotel booked but we may not have our park tickets linked to our account at the time the 60 day window opens. Can we still book our fast passes at the 60 day window? No, you must have tickets attached to your mde. Would you use your third FP for barnstormer or to meet Rapunzel? We already have a FP for 7DMT and Peter Pan. Can you help me understand the two tiers? thanks!!! Epcot and Hollywood Studios limit you in how you book Fastpass. You can only choose 1 of the Tier 1 attractions and 2 of the Tier 2 attractions per day at those parks. You’ll have to pick one of the 3 you mentioned. I would chose Frozen. Kenny if I have breakfast with the princesses in Norway at 8:15 should I send my husband out early to wait in line or just get a fast pass since the breakfast could be seated late? Fastpass. You can’t wait in line for Frozen Ever After without your party with you. We’ll be visiting WDW October 14-20. One of these days (Oct 18th) we will attend only MNSSHP (already booked). Is it possible to reserve FP also for the Halloween Party? We are going end of October. We booked 2 fast passes between 4:00-7:00. We don’t have park tickets for that day….we just have the party ticket. You can’t book fast passes during the party. Correct, there is never FP during the actual party and isn’t needed. Thank you Jacqueline! Thank you Kenny! Do you know if the Jungle Book show will be going on last week of October? Planning fast passes. Thank you! I’m curious why you start with the latest date that you are staying and work towards your start day when making FP reservations? We check in on Friday September 30th. We plan on doing Epcot on Saturday (10-1), Animal Kingdom on Sunday, Epcot Monday, MK on Wednesday, HS on Thursday and MK on Friday (10-7). If I start with the 10-7 date will FP spots still be available on for the beginning of our stay with working backwards? Because Fastpass and Meals are always easier to find at the end of your trip. Onsite guests receive 60 days for the length of your trip. More options on difficult FP+ like Seven Dwarfs Mine Train and Frozen Ever After on the last days of your trip. How does one get Anna and Elsa Fast Pass? I thought they were at Princess Fairytale Hall but I can’t find any website that states that is a fast pass, nor do any of my books state that. Just left Disney and we waited in line for about 15 minutes for the meet in greet of the two princesses. I was amazed. They are very efficient with this meet in greet. They are in Norway at Epcot on the other side of their boat ride. Where can I see the height restriction for Fastpasses rides? Should a fast pass be wasted on the jungle book show? I’m hearing the theatre is pretty big. No, it’s not mentioned on here as well. I am staying off property for a 7 day WDW trip and, like everyone else, trying to plan the FP+s that I want to get for my trip. Can I book all 7 days at once when it is 6 months prior to my first day or do I have to go into the system 7 separate nights? Off property guests can only book one day at a time. You book FP+ 30 days out for offsite and 60 days for onsite. Dates for booking are always on my Crowd Calendars. No. And it likely won’t appear until right before opening. Hi, Kenny! We have never been to AK before & will be visiting this fall during our trip. I’m wondering what is the benefit to FastPassing the shows, in particular, Festival of the Lion King. Do the seats go very quickly if we were to use our FP for other rides, instead? Thanks for the info! 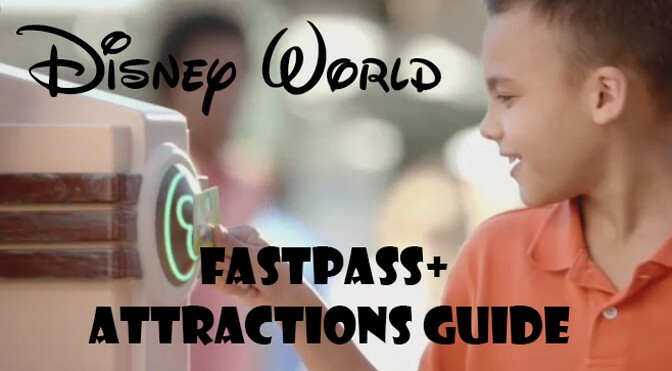 How does it work with child swap and fast pass plus. for instance it is my wife, 4 year old son, infant son and myself. If we wanted to do the 7dmt would both my wife and I need to fast pass so my son could ride twice and one of us stays with the infant or could she get 1 and use child swap so I don’t need to use a FP? I don’t get this. What I [mis]understand is that marika wants to meet A&E and go on on 7DMT. Why can’t Marika get FP+ for both at the 60-day mark? IF 7DMT FPS are quickly taken (I think that’s what you imply), how can marika change FP+ from another ride to 7DMT? You can, but your priority MUST be Anna and Elsa when doing the first search. What is the advantage of using FP+ for parades? Kenny, thank you very much for all this information. It is wonderful! If I understand this correctly, does that mean if I use electric parade as a FP+ option then I can’t use any additional FP+ options at the kiosk until after the electric parade? I just wonder about booking the shows especially if they are in the afternoon. Thanks! Yes, that is correct. If there are 2 MSEP on your day, you could easily see the 2nd one without need FP too. Thank you for answering my question and for having this awesome site. It is very informative. This website is AWESOME! Looking for some advice…were going to magic kingdom for one day in April and staying onsite. I’m going to try to book fastpass at midnight 60 days out and trying to decide whether to try for anna and elsa, 7dwarfs mine train or both? Hi Kenny, I see that we do not need a FP to meet Merida at MK. I just want to make sure this is right. She is my girls FAVOURITE princess and someone they are dying to meet. I don’t want to miss a FP for her and then end up standing in a long line. About how long on avg is the line to meet her with a FP? Thanks! Thanks for your help Kenny, was able to get Anna and Elsa, Mine Train, PP Flight, Big Thunder, Cinderella and Rapunzel, and Ariel’s Grotto at MK. I was reading that the certain in park fastpasses Don’t count towards your 1 active fastpass. Would you happen to know which attraction they would be talking about??? So if I am going for 7 days I need to book my FFP seven different days? Not all at once like for dinning? I did not know this. Do you know if it is midnight Eastern or Central time zone? I cant wait I am hoping to get Anna and Elsa. I don’t understand what the FFP for the parade is….special sitting? Where is the special area at? I have a FP booked for this coming up…But never knew where it was at. This is great info, Kenny, thanks so much! I have been stressing so much about my selections & rearranging things almost every day. Last time we visited we had FP+ and paper FP, so it felt like we hardly waited for anything. Seeing the selections listed by priority makes things a lot easier to plan! For on site guests I know we can book at 180 days + 10 for dining, but we don’t get that extra +10 for fpp, right? If I’m going to mk multiple days, and want to get passes for a&e or 7dmt on more than one day, I’ll have to be up at midnight to have the best shot at getting these, correct? It’s just 60 Days out for FPP. The actual date you could book is listed on my Crowd Calendars as well. Yes, they usually list them between midnight and 1am. I was able to book 60 days +10 for FP+ when I booked my FP+’s last month. Thanks for the reply Todd!